This is such a lovely book, both in the stories and in the pictures. 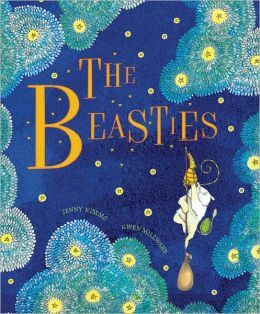 It is the story about a little girl who has moved into a new house and is having a hard time sleeping, until the Beasties who live under her bed teach her how to tell bedtime stories. Both of my daughters have enjoyed this book, and it is one I still like to read after many, many repetitions. It is not a rhyming book, but parts of the text have a lyrical quality that I really enjoy. It would be a great book for a child struggling with a move to a new house or worrying about monsters under the bed… but neither of these applied to my kids, and they still loved it!